From Instagram: Our little bean at 10.5 weeks. I’ve missed doing these weekend reading posts, but man has the break been good! You may have seen this on Facebook or Instagram already, but we had quite the emotional and nervewracking ride this past week. After two weeks of intense and debilitating morning sickness and exhaustion, last Saturday I woke up—miraculously!—with energy. I felt even better by Sunday, and Sunday night my symptoms all but disappeared. When I woke up with heavier, bright red spotting in the middle of the night on Tuesday, I just knew. We’ve done the whole miscarriage thing enough that I wasn’t necessarily even surprised by the progression of things, and while I felt at peace, I just wanted it to be over with. Sean held me for a couple of hours in the middle of the night, and at 5am, I texted my mom and asked her to come. She was on the road as soon as the sun was up, and arrived midday. By that time I’d spoken to a nurse at my old OB’s office (they’re no longer providing OB care), who scheduled an ultrasound and made a “problem” appointment with the doctor, and so we waited for the 7pm ultrasound to confirm what I knew. To be honest, there was never a moment of doubt in my mind that the baby had died, and I was anxious to move forward. 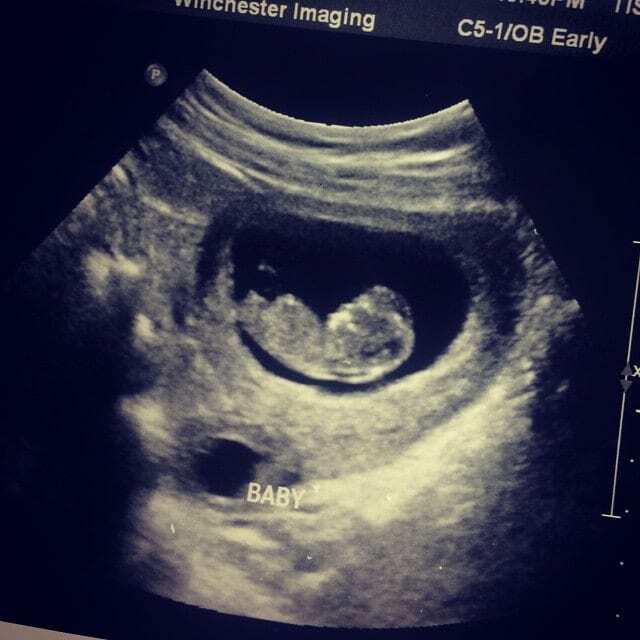 I knew in my heart that I wanted a D&C because I just could not handle the idea of delivering a baby at 10 weeks, and I kept thinking that what I most wanted was for it just to be over. When we arrived, the ultrasound office wasn’t busy and they took us right back. I told the tech why we were there, and as soon as the baby showed up on the screen, I realized that the process was going to be even harder than I anticipated. And then I saw a little flicker. Before I could fully process it, the tech leaned forward without a word and turned on the volume, and we heard our baby’s heartbeat loud and clear. I just looked at Sean across the room as we tried to make sense of how this could possibly be true. At this point, we’re just so thankful—thankful for a healthy baby, thankful that I’m feeling so much better than those two very hard weeks, thankful for medical technology that let us confirm that the baby is healthy. And I’m hoping that was the last surprise this baby has for us! P.S. Have you signed up for this free homemaking mini-course yet? It’s only available this weekend, so don’t wait! I’m so very happy for you that all is well with your wee one!!! Thank you! And i can’t wait to try those rolls now that I’m feeling better! Oh, my heart sank as I read. So, so happy this baby continues to fight. What does God have for him/her to do??? It’s so nervewracking, Jenny! This is my second subchorionic hemorrhage, but it’s gone totally different than the first time, and I think bleeding during ANY pregnancy is enough to make you crazy! Thank you so much for sharing your happy ending and for your prayers! SO glad to hear things are ok. How nerve-wracking! And yet you keep right on going, always being a great mom, wife AND blogger. Color me impressed! I’ve been through a lot of miscarriages too, so my heart is so happy for you! What an enormous blessing from the Lord! Oh, Leigh, I’m so sorry for your losses. Thank you for your sweet message! OH! I’m SO very glad to hear this wonderful news. Your little bean is beautiful!!! God is SO good….all the time! Congratulations. Thank you so much for sharing in our joy, Sabrina! SO very happy everything is okay! I saw this on FB and instagram, but I still loved reading this post. Congrats again another little. (And I’m so glad you are feeling better!